In the case of an area-wide emergency, do not use your telephone for the first few hours following the event unless you have a life-threatening emergency and need to call 911. If you must reach friends or family, call or text an out of area contact. In an area-wide emergency, such as an earthquake, the best way to help yourself and your loved ones is to be prepared by having a plan (www.co.thurston.wa.us/em) in place. Listening to a battery powered radio is the best way to get information about the emergency, and following an emergency, you can contact your local emergency management agency for recovery information. Before you need help in an emergency, be sure to understand how the type of phone you use affects your call to 911. Cell phones may not automatically tell us where you are. Know the capabilities of the device you are using (landline, cellular, VoIP) when calling 911. If we don’t answer right away do not hang up. Stay on the line until we answer. Your ability to get through if callers repeatedly call and hang up may be delayed. Try to stay calm, listen carefully, give information and follow all instructions. In an emergency, seconds matter, so being knowledgeable and prepared can make all the difference. Knowing when to call and what to expect when you phone 911 can help reduce fear and feelings of helplessness in an emergency. The more you know what to expect when you call 911, the faster we can get you the help you need. If you dial 911 for a non-emergency matter, you are tying up resources that could be needed in a real emergency. Follow all instructions the call receiver gives you, and don’t hang up until the call receiver does. When calling 911, one of the first things you’ll be asked to provide is the location of the emergency you’re reporting. The call receiver may not automatically know your location or may ask you to confirm it. Tell the call receiver the location of the emergency, and provide landmarks such as cross streets and mileposts when possible. Be aware of your surroundings checking mile markers when you travel and names on billboards or signs. This could save a life when trying to get help to the correct location. 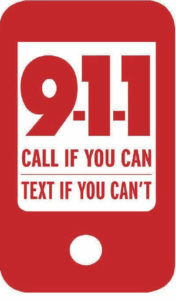 Callers should only use texting when calling 911 is not an option. Using your phone to call 911 is still the most efficient way to reach emergency personnel. Texting is not always instantaneous, so if it is a life-threatening emergency, it may take longer to receive and dispatch emergency services because of the time involved. When texting, someone must enter the text, the message must go over the network and the 911 dispatcher must read the text, ask questions via text and text back. If you are not within range of the towers in Thurston County, your message may not reach 911. If you have Usage Controls, you should have this feature removed to ensure full text to 911 capabilities. Text to 911 should only be used to communicate between emergency help and the texter. No pictures, video, attachment or other recipients can be received by 911 at this time. Any medical emergency including non-injury falls or patient assists. Any type of fire, even if out. Power lines down in roadways or areas that citizens could come into contact with and potentially be injured. Any crime in-progress (robbery, burglary, prowler, fights, etc.) or if suspect is still in area or close by. Power outage: PSE customers call 1-888-225-5773. You should call your utilities company if you have questions or need to report a power outage. For state highway information: 511 is the number for traffic information in Washington State. Road conditions 1-800-695-ROAD. Tune in to your local television or radio broadcast. County road information: http://www.co.thurston.wa.us/em/ Sign up for AlertSense and receive hazardous situations such as river flood alerts. Social services: 211 is available in Washington State to help with health and human service needs. Other Agencies: Go to Resources page for more links.